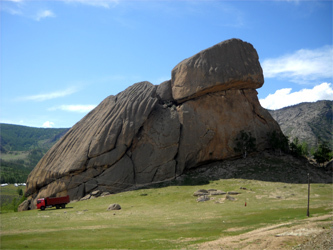 Terelj national park is designated as a National park in 1970-s and is the place, where Mongolians want to travel and relax with excitement on wild nature. Terelj National park landscape is very picturesque on forests, granite rocky hills, rocks with interesting shapes, rivers and green meadows. There every person is impressed with the nature beauty and color harmony. 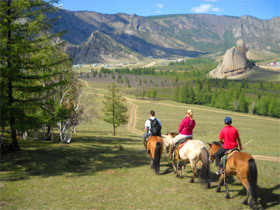 Strolling on green meadows carpeted with edelweiss and a dazzling variety of wild flowers, exploring the fascinating view of rock formations against a backdrop of pine covered mountains, riding a horse and galloping across bushes and streams are wonderful outdoor activity in this place. Here some of the rocks resemble the long spiky bodies of prehistoric animals. The park comprises a small separated valley, where is the most spectacular giant turtle rock natural formation and a young man. Moreover, the park attracts geologists' attention considerably. In beginning of 1990-s German, Chinese and Russian geologists made the research and prospect for jeweler stones. Stones in some places glitter in sunshine with incredible golden color. In 1696 Mongolian horse mounted army, consisted of more than 10.000 soldiers from main tribes and lead by famous army leader Chingunjav, made battle against Manchurian army in Terelj valley in order to make the country free off Chinese-Manchu. However, in this battle Mongolian army was lost in some reasons. Still today the some kinds of arrowheads are found in this rocky hills. The sanctuary for Chinese princess, who was presented to Mongolian influential lord in the reason of making the foreign relation and political atmosphere peaceful and constable, is dated to 1740. Next to the tomb is a stele once set on the back of a stone tortoise with an inscription by Manchu emperor Qianlong. A sanctuary, surrounded by a wall of white stones, was built near the tomb according to the Manchu customs. Later this temple and walls were destroyed down in 1941. Offertory site for Turkish King Tonyukuk, which is dated to 720 A.D, is a better example of blue Turkic remains. A few statues includes block of stone dedicated to Tonyukuk and inscribed with a long text in the runic characters of Turkish. The 62-line text of the Turkish inscription on the stele traces the life of Tonuykuk King and the historical events he took part in. According to the Kalachakra sect of Buddhism the mediatation is held usually in mountainous area in Mongolia. The meditation doing mountain should be granite rock and area should cover the area with frosen layers in deep ground all year around. In Mongolia buddhist monks used 3 places for doing meditation. 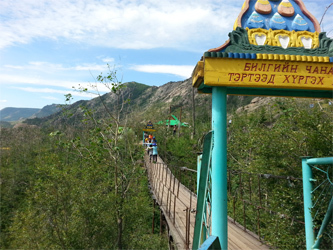 One is Tovkhon Monastery in Khangain Nuruu National park, the second is this temple -Araybal temple in Terelj park and the third one is Baldanbereeven temple in Khentii province. Aryabala meditation temple was built in 1810-s by mongolian and tibetan artists in Gorkhit valley of present Terelj national park. In many cases buddhist monks from Manzushir monastery came to this temple to make meditation. The temple style is more tibetan styled like white square shaoed and white colored main building and porcelain roofs decorated with buddhist and religious signs. In 1937-1939 mongolian communists came to this temple and destroyed it completely and killed some monks from this temple. Later in 2000 buddhist monks of Lamiran temple in Ulaanbaatar initiated the project to restore this temple and completed the restoration work in 2004-2007. Lamiran temple monks sometimes come to this temple and cater religious service here and in many days of year it is open place for visitors and tourists, who want to thank for the god and do meditation. The decoration at the temple houses are amasing, especially depicting what is the paradise and what is the hell. Inside the temple houses you will see the stories of some enlightened men's stories at the house wallpaper and the main altare is Buddha Arya Bala.